What does it mean for a community to be well, healthy and happy? A big question, and a complicated one with many answers – and depending on who is asking the question. Similarly, what can a dancer bring to this situation? My work has developed where relationships with ourselves, with others, and with our surroundings are central to everything. When it comes to bringing the body into focus many people shrug and say that they do not like their body, alienating and bringing distance between mind and their physical being. My concern is to establish trust in all interactions with others, followed by developing dialogues between the community and ourselves as able to be vital and imaginative. One example grew out of a two-year commission from Wansbeck Council and the ex-mining community where older people said they were nervous to go out walking on their own. I established a local walking group, and when we were invited to finish our morning walks at the local primary school to have our dinner with the children, I facilitated early afternoons where the older walkers and the younger children shared themed conversations with each other. From these conversations the children and I devised a choreography called My Big Heart and performed it at the school to the walking group, family and friends. 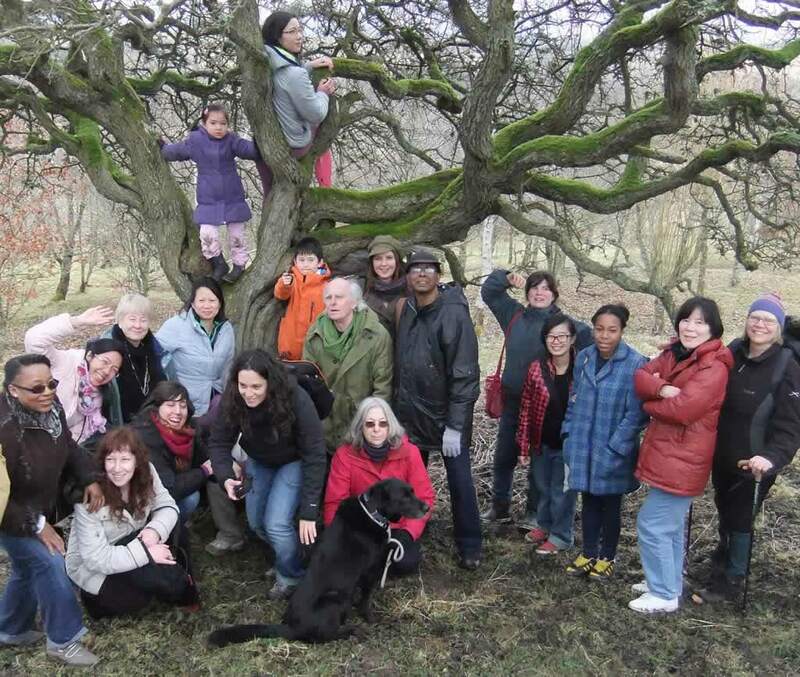 A project in Tynedale involved bringing older, middle aged, and younger people together for various events and activities, and subsequently into a performance ensemble where new relationships were made and ideas shared and developed. We called the new work I saw myself standing, but you saw me flying. Even the projects where I have developed performances at grand locations like Belsay Hall, Castle and Gardens, and Seaton Delaval Hall, I have sought to include innovative approaches to community engagement where previous access to participation for local communities has been either poor or non-existent. This experience was echoed in Lille in France where I spent much of the month of June in both 2011 and 2012 at the Maison Folie Arts Centre working alongside artists and activists Penny Rae and Carl Cardonnier, who have a long track record of devising and leading projects in Europe and Africa with displaced people. In Lille we developed site-specific installation performances with disadvantaged young people that brought focus and connection to their environment. In a broader context I have contributed to think tanks, facilitated open space discussion, and developed programmes of engagement as a trustee of Intercultural Arts in North East England. IcA works with arts, diversity and participation, and I have contributed to developing and delivering its current programme of regional forums and practice exchange events. Often working with other arts facilitators, we have developed these activities to initiate and support arts practice that promotes equality and inclusivity.